As you can probably tell from my thoughts and resources pages, I love to share what knowledge I have to whomever will listen. I’ve had the honor of sharing the stage with the likes of Michael Bierut, Stefan Sagmeister, Paula Scher, James Victore, and Erik Spiekermann at design, web, type, and illustration conferences all over the world. To inquire about having me speak at your conference, shoot me an email. Generally I like to book events no more than 8 months in advance. LetterWest is an incredibly intimate event spearheaded by Becca Classon in which forty attendees and the speakers share time in a collective space in Utah—the speakers giving talks or workshops. OFFF is an incredible creative conference with a huge lineup of artists from diverse backgrounds. This is my second time participating in the festival, and I’m extremely excited to head back to Barcelona. The symposium is a once a year, one-day event where all of Hallmark’s creative organization and some of their key business partners all come together to pause and be inspired by though-leaders, style influencers and creatives from around the globe. Layers is an inspirational conference that runs alongside Apple’s WWDC. Collision is an enormous conference with over 100 speakers including CEOs from top companies, captains of industry in tech, and influencery artist folks like yours truly. I mean...Al Gore is also speaking. This year I’ll be heading up to Portland to participate in their amazing design week! I’m hosting a sold out lettering workshop and am taking part in a group lettering art show. I’ll be speaking at Cal Poly in San Luis Obispo in partnership with AIGA. As a part of Facebook’s artist lecture series, I talked bout my work and in particular struggling to stay small in a region obsessed with scale. Levi’s put together an amazing panel of women for their event Fashion Your Fit, held at the San Francisco flagship Levi’s Store. Moderated by Alexis Jones, it was an incredible night, with great conversation and everyone got to walk away with a free pair of jeans. I had the pleasure of speaking at American Greetings alongside many other notable speakers at their in-house conference, “Infusion”. Hear that honking sound? That's a flock of your letterpress printing, type geeking, designerly friends getting ready to migrate to Hamilton Wood Type & Printing Museum's Wayzgoose 2016. Mark your calendar for November 4, 5 and 6 and plan to join us in Two Rivers for our annual type conference. The AIGA Design Conference is the biggest event of the year for creatives from all across the country. Be there as the design community comes together for provocative speakers, nightly networking receptions, live competitions, exhilarating exhibitions, innovative professional development sessions, and face-to-face roundtables with your design heroes. “Present Tense” is the 12th national conference of the American Craft Council. The convening’s function is to locate, through the interchange of ideas, the place of craft in our contemporary moment. For two and a half days, join the ACC for a convening of moderated conversations between prominent intergenerational representatives of the field of contemporary craft with opportunities for open dialogue among conference attendees. Reasons to: is the award winning 3 day international conference with a festival vibe. It brings the very best international speakers from design and code to take to the stage and inspire, inform, entertain, thrill, teach, and network with web designers and coders that attend from all over the world. The Yellow Conference is a gathering for creative, entrepreneurial women who desire to ignite passion and bring goodness to the world through everyday living. The Illustration Conference is one of my favorite conferences. This year I’ll be participating in a panel with other female illustrators as well as conducting a lecture-style workshop. We’ve ditched the lectern and curated an exciting new program that will focus not only on inspiring, but also enabling the creative community. The Thursday and Friday programs are about giving you real-time, global insights into getting the best out of your business or your role within one. It’s about sitting next to, or mingling with like-minded people that will open the doors for potential collaborations and partnerships. Future State sessions with the likes of Google, Netflix, Uber, Facebook, ACE Hotels, Commune Design, Atlassian and more, will also give you expert advice and a direct insight into the innovative ideas that are transforming our world. Want to do business? Want to know where your industry might be in 10 years? Then don't miss this global gathering. Saturday has been curated to give the emerging community the chance to upskill and maximise the potential to make some noise in respective industries. For those looking to enter the workforce, change careers, or start a company - this day is for you. I’ll be giving two talks in Kansas City this spring—the first to KCAI as a part of their “Current Perspectives” lecture series and the second to the KC AIGA branch. Adobe Max is a three day festival with hundreds of sessions, labs, and creativity workshops, organized into six tracks: Creative Careers, Digital Publishing, Graphic Design & Illustration, Photography & Creative Imaging, Video, and Web & App Design. Re:Make is a conference and festival designed to celebrate and explore the creativity in all of us. On Friday, September 11th, Brit + Co will host its third annual invitation-only conference about how creativity and technology are changing our daily lives, from our hobbies to our work. You’ll hear from people across the country who are literally changing the world with their creations, both analog and digital. Connect with leading designers, entrepreneurs, bloggers, artisans and brands, all of whom are shaping today’s creative movement. Design professionals from all over the world gather for four days of community, inspiration and skills building. Now in its 13th year, UX Week delivers new tools you can put to use immediately. I’ll be speaking in Omaha in February, my last traveling speaking gig for much of 2015 (no traveling from March 1st to early Fall 2015). I’ll be incredibly pregnant, so it should be a really fun talk! The Lipscomb University Art Department will host me in its Presidential Lectureship for Art and Art History on Jan. 23. The lecture will take place in the Ward Lecture Hall. Reception at 5pm in the John C. Hutcheson Gallery, talk at 6pm! The talk will be an in-depth look into my process, with tons of tips and tricks of how to create beautiful lettering work. Watch a video of this talk! The Watkins Visiting Artists Series is an annual yearlong program that welcomes nationally and internationally recognized fine artists, designers, filmmakers, educators and critics to the campus and the community. This will be the first of two talks I give in Nashville, they will be different talks incase you wanted to attend both! Today’s tech products live and die by design. At Roadmap 2014 you’ll hear from the world’s leading creators that are using experience design to disrupt industries. Semi-Permanent brings together internationally renowned designers, artists and creative icons for live events, presentations, workshops and parties. Be inspired. Airbnb hosts design talks in their beautiful space. Check in will start at 6pm and promptly end at 6:50pm in order to start the program. Please note an RSVP/per person is required to attend. They will not be able to accommodate any walk-ins. Title links to RSVP. Come and reignite your passion and imagination at Circles Conference. Circles is a two-day gathering of creatives from around the world. Learn from world-changing thinkers and innovators in both the non-profit and creative community. Mingle with others who share the same passions you do! Topics will encompass passion, creativity, processes and journeys. So if you are looking for the typical HOW-TO session, this is definitely not the place. Join AAFUtah as I walk through my process, share stories from projects like my work on Wes Anderson's Moonrise Kingdom, and give plenty of helpful tips on how to better your analog and vector skills. This talk takes place at 11:30am at Publik House, 975 S West Temple, Salt Lake City, UT. Tickets on sale here. With our upcoming SmashingConf New York 2014, we'll explore real-life projects, workflows and hands-on insights that we all can learn from and use right away. Same game, same rules: 1 track, 2 conference days, 7 workshops, 18 excellent speakers and just 350 available seats. Kerning is the first international conference in Italy dedicated solely to typography and web typography. On June 5th (only workshops) and 6th (conference day) 2014 we will gather in Faenza, in the very heart of Italy, top notch speakers from the whole world of digital and web typography to create an unique event. 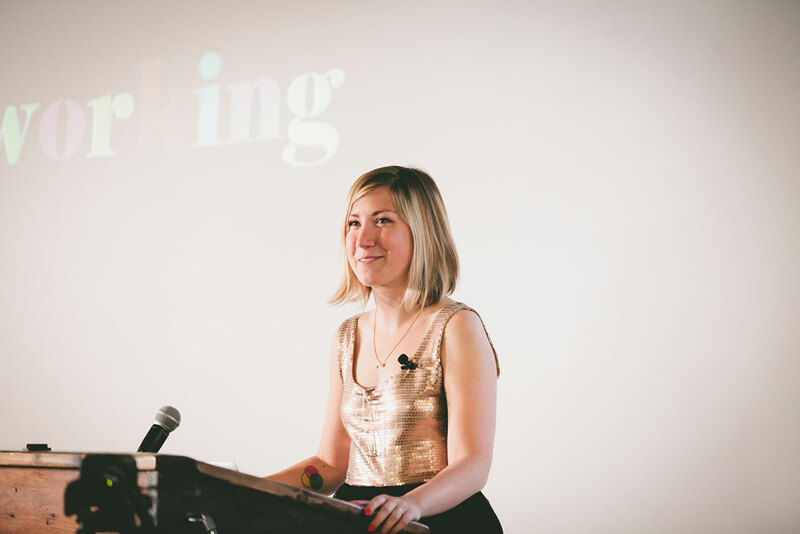 Kerning features a day of workshops (Jun 5th) and a Conference day full of talks (Jun 6th). Kerning offers a very interesting chance to meet developers, gurus, managers and innovators from all over the world. Where does the name beyond tellerrand come from? It expresses the aim of everybody involved to look a bit further, look beyond the edge. It also reflects the global perspective of our event. The expression is a mix of the English word “beyond” and the German phrase “Über den Tellerrand schauen,” which means “Think outside the box”. Born from the idea of creating a platform that fosters art and design within our community through hands-on experiences, workshops and design in action initiatives. WeMake hosts sketchXchange a monthly night of inspiration and drawing and a chance to peep into the sketchbooks of some of Portland’s favorite illustrators. WeMake also coordinates discovery workshops with Portland’s craftsmen community. A new, independent speaker series in Austin, TX, organized by UnderConsideration, featuring some of the graphic design industry’s most awesome people. Jessica Hische joins AIGA Jacksonville as keynote speaker and guest judge for the organization’s 25th Annual Portfolio Review. The event gives students and recent graduates from the region the opportunity to interact with local design professionals for feedback on their portfolios and advice for getting a creative career started. Hische’s keynote presentation kicks off this two-day event at the University of North Florida. I’ll be touring around Alaska for a week this March, making three stops for speaking engagements! I’ll be speaking on my process and showing recent projects along with all the educational nuggets I can inject into an hour-long lecture. Graphika Manila is the premiere multimedia and graphic design event in the Philippines. Since 2006, Graphika Manila has attracted over 10,000 design students and professionals and is now hailed as one of the most influential multimedia events in the country. Farmhouse Conf 5 is the fifth and final show of Hollywood’s best backyard storytelling conference. 1 day / 1 track, 10 speakers (5 men / 5 women), no slides, no projectors. Amazing people telling incredible stories of Collapse. The event brings together people from a variety of backgrounds and influences. The big vision is to get amazing people together, inspire them, give them time and space to cross pollinate... then watch what great things come from it. FHC5 will invite back all past speakers and bands to come back and be a part of the reunion / farewell show. Attendees are welcome to camp in the backyard if you bring your own gear (tent, sleeping bag, etc). All the food and drinks are provided during the day and night. After the day of talks, we party into the night with live music, free booze and tasty treats. Semi-Permanent is excited to be back in Melbourne for our fifth year. We have another exciting lineup of the worlds most creative professionals from a diverse variety of fields related to visual arts and design. Come and be inspired by creatives at the top of their careers, individuals who see art and design as a passion and a lifestyle, not just a job. Since 1980, Design Camp® has been AIGA Minnesota’s premiere event and the largest regional design conference in the country. Held annually in late September/early October at a lodge in northern Minnesota, this event sets the standard for design conferences across the country. Design Camp provides an atypical conference structure, mixing indoor and outdoor activities with both educational and social events. Design Camp lasts for three days. Campers arrive Friday morning for registration and depart Sunday afternoon. Five keynote speakers set the tone for camp, while small-group workshops and creative sessions follow each presentation. Attendees (referred to as “campers”) stay in lakefront cabins or golf-friendly condos and meet in the main lodge for events and meals. Friday and Saturday nights offer much socializing and tend to run late into the night. Way Out West Talks is an initiative taken by Yay Festival and Luger and is a series of talks by inspiring people on Sweden’s most credible music festival Way Out West. This is the first year but the lineup is filled with great names! An Event Apart is an intensely educational two-day conference for passionate practitioners of standards-based web design. If you care about code as well as content, usability as well as design, An Event Apart is the conference you’ve been waiting for. I presented to AIGA Houston, it was a packed house and the venue was amazing! And Ed, the manager of the space, kept the scotch flowing freely which made for an interesting night. I am Batman, and you can be too! To be a good designer, you have to find a balance between your Bruce Wayne side and your Batman side. The Society of Design in Pennsylvania put together this epic invite in which they ordered custom vanity license plates to spell out a message to me (and now drive around with them on their cars!) to get me to come out and do a talk. Of course I said yes! Since 1995, Design Indaba has been committed to a vision that is built on the belief that creativity will fuel an economic revolution in South Africa. As such, Design Indaba is a celebration of design in a country iconic of the triumph of the human spirit. Proof that even the most intractable problem can be neutralised by the will of the people, resurgent South Africa is a beacon to the world. Design Indaba typifies this can-do spirit through its belief in design and how it can help solve the problems faced by an emerging economy. With the right support, a better future can be designed. By attracting the world's brightest talent, Design Indaba has become a respected institution on the creative landscape and one of the few global events that celebrates all the creative sectors - graphic design, advertising, film, music, fashion design, industrial design, architecture, craft, visual art, new media, publishing, broadcasting and performing arts sector. Besides the flagship conference and expo,Design Indaba has grown into a multitiered experience that incorporates an extensive range of elements such as events, publications, education, training, business, development and community initiatives. Single-track conference with eight talks, carefully curated to excite, enthuse, and seek outcomes, affordable half-day workshops covering web typography, responsive design, prototyping and much more, and two floors of epic after–party action. Ready to Inspire is a brand new conference about the craft of web design, type and code. It has workshops, live music, meetups and parties, but above all an exciting lineup of today's craftspeople and mind blowing new faces. We believe the group of speakers we have gathered will inspire you and get you ready to rock 2013. Fuel your brain with awesomeness and ignite your creativity. Make powerful connections and enjoy all the great things this event will offer you. Designer Dialogue with Jessica Hische at the University of Hawaii at Manoa Art Auditorium. Spend two content-rich days with some of the most forward-thinking Designers and Developer building today’s Web. Limited enrollment and longer sessions allow for more meaningful interaction with our expert speakers and fellow attendees. Join us to expand your skill set and use updated techniques to refine your Web design craft. We Love Graphic Design is a celebration of the world of graphic design in the shape of an annual one day seminar featuring lectures from some of the most important, inspirational and insanely creative graphic designers working today. A lecture for students at UVU in Utah. An Event Apart DC features 12 great speakers and sessions. Following the two-day conference comes an intense full-day workshop on Responsive Design led by Ethan Marcotte (author, Responsive Web Design, A Book Apart, 2011). Ever since web fonts became widely available and standards compliant, web designers worldwide have entered into a torrid love affair with type. It’s amazing to see live typefaces replace type-as-image stand-ins. But before you consider yourself a typographical expert, hear Jessica out. She will give you more than a lesson on how to use type online. She’ll cover type history and terminology that will make your clients cower at your expertise; review the available services; and talk candidly about which are appropriate to use in different circumstances and which are dangerous to the type industry. She’ll end with tips on how to make good typographical choices. Spark is a lecture series put on by Target for their marketing team. The Illustration Conference [ICON] is a grass-roots, professional organization established in 1997 to serve the illustration community and promote the use of illustration in all media, provide a platform for illustrators and image-makers to address issues from a tight knit community and develop new approaches to this historically significant profession. ICON is a not-for-profit, all volunteer organization supported by our sponsors and attendees registration fees. Unlike many other conferences, ICON is not supported with membership dues. Since the first conference in Santa Fe, ICON has been dedicated to the advancement of art, design, and communication in the graphic arts fieled and supports the exploration of new concepts, media, technologies and professional opportunities for artist and image creators. ICON is committed to creating an ongoing dialogue that serves the whole industry of the applied graphic arts and the clients that illustrators serve. Each conference brings together a community of illustrators to explore new concepts, media, technologies, and professional issues. Programming topics fall into these three important categories: Inspiration, Industry and Business. I didn't come up with the title of this talk—John Hendrix wrote it as a placeholder and then they ended up keeping it, ha. The talk was a slide-free 20 minute presentation in reaction to a panel discussion at the last ICON about the future of publishing (which was bleak and involved a lot of motion-centric conversation). In this talk, I encouraged illustrators to learn new technology, but if they decide after trying it that it's not for them, to not feel pressured to pursue a career they have no interest in. If you are passionate about what you do, you will find a way to make a career of it. TypeCon2011 surges into the Big Easy. Dozens of the brightest names in type and design will share their knowledge and skills, exploring topics such as: Japanese typography; the champions of readability; typography for the web; the graphic history behind QSL cards; book design and bookbinding; Fontographer basics; letterpress techniques; connections between lettering and lingerie; historic New Orleans print engraving; the lack of Latin typographic heritage in Turkey; glass gliding; and so much more. CreativeMornings is a monthly breakfast lecture series for creative types. Each event is free of charge, and includes a 20 minute talk, plus coffee! Jessica seduced a packed house with her enthusiasm and colourful language, sharing personal perspectives on the importance of typography as an example of the intersection of art and technology. Commenting on the stupidity of the question "What is your favourite font?" Hische encouraged attendees to stare closely at type, to learn how to select and use type well to express meaning, and most importantly, how to actually use the hidden technology that goes into type design and production. She passionately appealed to the audience to advocate for the value of type design, fearing the alternative being a decline in awesome type. Focussing on issue of technology, Hische explained that even as "just a letterer" she learned how to code for the web and learn new type design applications. In her opinion, learning tech is not only fun, but designers are lazy if they don't. In the audience was Hische's friend Jon Tan, designer and co-founder of Analog, Mapalong and Fontdeck, whom she dragged on stage to engage in a casual conversation about the art and tech behind typography, as well as the value of creativity and hard work it takes to produce something like a font that many take for granted. Jessica Hische does a lot of things, but the thing she does best by far is draw letters. In her pep-rally of a talk, learn why it’s important to appreciate niche industries, and why all type designers deserve a hug. TYPO conference speakers are innovative designers, professors, marketing experts, scientists, artists, journalists and much more. They present and discuss diverse approaches in the fields of communication and design. TYPO inspires, offers insights and experiments, encourages the exchange of knowledge and is a creative playground for communication professionals. Jessica Hische makes a living with something special: she is a letterer. Whereas graphic designers increasingly focus on type, only few understand and appreciate the difference between lettering, calligraphy and type design, i.e. what separates the wheat from the chaff in the world of letters. In her presentation Jessica Hische will explain, how she accidentally found her way into lettering, and she will inspire her audience. So that everybody will rush home and start working on his/her own projects. OFFF is an entity in continuous transformation, alive and evolutionary. More than a decade ago, it was born as a post-digital culture festival; a meeting place to host contemporary creation through an in depth programme of conferences, workshops and performances by the most relevant artists of our time. In Jessica’s pep-rally of a talk, she’ll cover what separates the men from the boys in the type world, cover some pretty geeky terminology and explain why semantics make a difference when talking to clients, and she’ll even throw in some pretty pictures and animated gifs to cleanse your palette. Originally an initiative of The Small Print when it begun in early 2009, OFFSET has quickly grown into an strong entity in itself. Run by Peter O’Dwyer, Bren Byrne and Richard Seabrooke (all creatives living and working in Dublin) it has become Dublin’s premier creative festival attracting speakers and visitors from all over the world. In the 2 years since inception OFFSET has produced over 100 hours of presentations, workshops, debates, interviews and Q&A’s with some of the leading creatives in the world, several large scale gallery shows and some proper full-on party nights. El FID nace como un festival de diseño transdisciplinar, un lugar de encuentro en que la creación contemporánea se hace presente durante 3 días de conferencias, talleres, exhibiciones y fiestas. Durante su primera edición, pasado marzo 2011, visitaron Costa Rica catorce renombrados diseñadores de talla mundial, entre los Paula Scher, Joshua Davis, Mich Rojkind, Seymour Chwast, Max-O-Matic, Luba Lukova y Mik Urmeneta. Además, 5 de estos conferencistas impartieron talleres en donde se generaron espacios más cercanos de intercambio y educación. Lecture and round-table discussion with Washington University students within the illustration and design departments. Webstock 2012 will be bestest, greatest, most amazingly awesome conference ever. In the history of the world. Fact. Two action-packed days of aspiration, inspiration and brain stimulation, starring 20+ stars of the web firmament; a veritable hotbed of uber-talent. Experts in HTML5, CSS3, responsive design & enhancement, mobile app development, user experience, analytics and oodles more, this will be unmissable. As a part of the ADC Young Guns partnership with the Apple Store, I lectured at the San Francisco downtown location. Lecture sponsored by the Type Directors Club at A2A Graphics in Connecticut. The lecture was also live-streamed to TDC members that signed up. DesignThinkers is Canada’s largest annual design conference, and one of the most respected in the world, welcoming professionals from the creative and business communities alike. A Lecture for AIGA Colorado in Denver hosted at the beautiful Denver Art Museum. Oslo’s web conference gathering the best speakers that live and breath web design and development. While many designers are familiar with fonts, many don't understand the difference between lettering and type. Through examples of her own work and the work of typeface designers, Jessica outlines the differences between lettering and type, when each is appropriate, and why all graphic designers owe type designers a bottle of champagne. Now renamed “Reasons to Be Creative”. Three full days packed with amazing talks from the worlds best coders and designers. Expect lots of opportunities to mix and network with peers from over 30 countries. Expect to walk away inspired and invigorated and keen to get back to work to produce a killer project to be proud of! The HOW Conference is a massive annual conference that shifts location each year. I participated in the 2011 conference in Chicago. Design Ranch is an intimate, three-day, hands-on workshop-driven design retreat in a rustic setting on the banks of the Guadalupe River. Our workshops will rekindle your creative spark as they guide you through every facet of design and creative thinking. In my workshop, attendees created typographic friendship bracelets for themselves, and a friendship bracelet to be given away to another attendee. I collected the bracelets and handed them out to random campers and tasked the workshop attendees with finding and connecting with the new owner of their bracelet. Build is a small, yet perfectly formed, boutique design conference where interesting, talented web practitioners from all over the world come to share ideas, techniques and inspiration. Some are on stage; some are in the audience. Every year, AIGA Nashville builds a power-packed day filled with unrivaled industry talent and the most innovative and thought-stirring content. Attendees will be treated to world-class presentations, catered lunch and a roundtable discussion where the audience has the opportunity to ask questions of the speakers. DesignFest, by its size and number of international and foreign visitors, is the largest design event in Mexico. It joins academics and university students related to the design. Offers lectures and workshops given by renowned international designers. Semi-Permanent is a world leading design conference that to date has hosted 29 events in 9 cities, covering 5 countries, with over 200 speakers and 50,000 attendees. In 2012, Semi-Permanent celebrates ten years of events- that's a decade full of stories and wisdom from industry idols. The event covers all disciplines of design, including graphic design, film, fine art, illustration, web design, interaction design, photography, visual effects, animation, graffiti, motion graphics, stop motion, and architecture, and much more. The future of fonts as we know them is ever-changing. To help prognosticate, we're collecting some of the industry's leaders and asking them to explain what's coming next, why and how it will effect our everyday. We'll touch on lettering, foundries, collectives, technology and applications as well as web, customization and licensing. Fellow presenters were Georg Seifert and Joshua Darden. Moderated by Matteo Bologna.